“Deadheading” is simply a term used to describe the process of removing spent flowers and seed pods from the plant. When you remove the spent flower stems, you’re preventing the plant from using its growth energy to form seeds. To the plant, producing seed is its primary function in life so it will expend a great deal of energy to accomplish this. By pruning off the old flower stems, you signal the plant that it has not accomplished its goal and must try again. Since you’ve prevented it from putting any growth energy into this year’s seed crop, it will respond by putting all its energy into next year’s flowering effort. This translates into more vigorous growth this season and even more abundant flowering next year. Remember, the time to prune and deadhead all your early flowering shrubs is just after they flower. This allows them to produce more flower buds on the new growth that occurs over summer. How well they’ll flower next year is determined by how much energy they’re able to store during this growing season. 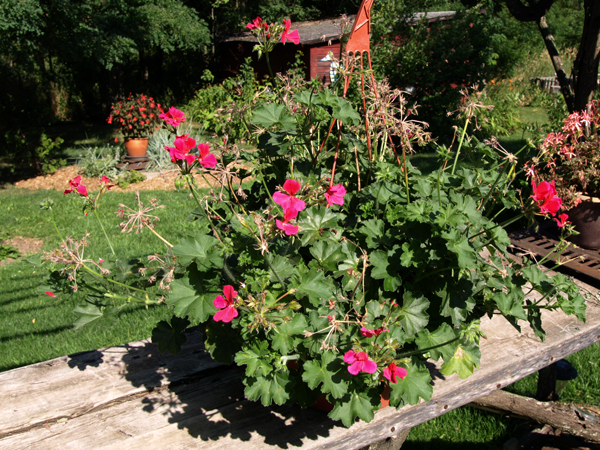 Below is a look at a geranium that hasn’t been deadheaded…it is a healthy plant but all those seed pods are preventing it from developing any new flowers.